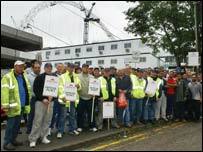 Workers held an unofficial picket after 200 of them involved in the new Wembley Stadium project lost their jobs. Last month, a deal was struck to transfer workers from Darlington-based Cleveland Bridge to a new firm when the County Durham company quit the project. On Friday, their new employer Hollandia/Fast Track cancelled the contracts of 200 on-site steel workers. Members of the Amicus and GMB unions held the protest on Monday at the Wembley Stadium building site. 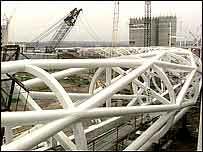 In a statement on Friday, the Wembley project's main contractor Multiplex said: "Multiplex has been advised that the decision by Hollandia/Fast Track resulted from independent action taken by the on-site steel workers, who had made unacceptable additional demands, despite agreeing new employment contracts with Fast Track in July. "Hollandia and Fast Track advised Multiplex that in breaching the new contractual agreement, the workers left them in an untenable position with absolutely no option but to end their employment." Multiplex said it had obtained assurances from Hollandia that the project would continue on schedule. It is understood the dispute follows negotiations about redundancy selection and also that the workers were looking for new agreements on working hours and long weekends. John Connor, 49, a spokesman for the protesters, said: "They have gone back on their agreements. "There has not been an industrial dispute on this project yet. All we want to do is work. We will be here as long as it takes." A 52-year-old steel worker from Middlesbrough, who asked not to be named, said: "All we wanted was... to be able to go home every weekend and see our families. We weren't being unreasonable. All we want to do is work." Steel worker John Gillett, 45, said he was offered his old job back by an agency less than two hours after his contract was ended. A GMB spokesman said: "GMB members should never have been scapegoated in this way. We are pressing for talks with the companies involved. "We want to see workers reinstated, back at work, and stability for the Wembley project."